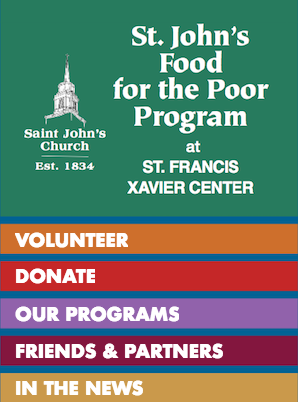 When you enter St. John’s Church or St. Francis Xavier Center premises or attend an event or program associated with St. John’s Church and/or St. Johns Food for the Poor Program, you enter an area where interviews, photography, audio, and video recording may occur. By entering the event premises, you consent to interview(s), photography, audio recording, video recording and its/their release, publication, exhibition, or reproduction to be used for news, web casts, promotional purposes, telecasts, advertising, inclusion on websites, social media, or any other purpose by St. John’s Church, St. John’s Food for the Poor Program, and their affiliates and representatives. Images, photos and/or videos may be used to promote similar events and programs in the future. You release St. John’s Church, St. John’s Food for the Poor Program, its officers, staff, volunteers, and each and all persons involved from any liability connected with the taking, recording, digitizing, or publication and use of interviews, photographs, computer images, video and/or sound recordings. If you do not wish to be filmed, please let the photographer/videographer, the pastor and staff know.